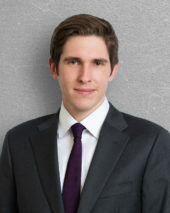 Henry joined Sive, Paget & Riesel after graduating from New York University School of Law in 2018. In law school, he participated in the Environmental Law Clinic with the Natural Resources Defense Council. He also assisted the New York City Bar Animal Law Committee in researching and drafting a set of best practices for the release of cetaceans held in long-term captivity. In addition to working as a summer associate at SPR during law school, he worked at the Brennan Center for Justice, where he assisted in the preparation of a comprehensive empirical analysis of Second Amendment jurisprudence. Henry holds a B.A. in mathematics from Clark University. He grew up in Brooklyn, New York, and is interested in land use law, infrastructure project finance, and urban planning.